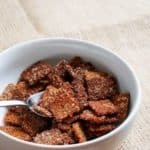 Low Carb Cereal | Cinnamon Toast Crunch! Oh man, this Low Carb Cereal recipe is the recipe of my dreams. Cereal would be my number one cheat meal and it would include several different kinds, including Cinnamon Toast Crunch. We created the low carb, guilt free version of Cinnamon Toast Crunch! Watch me walk you through how to make it, step by step, below. Cinnamon toast crunch is the best cereal by a long shot and I can guarantee this by asking anyone and everyone if it was a part of their childhood, and even adulthood. It is, without fail, the cereal I see the most people purchase when I am at the grocery store. We knew that if we were going to attempt a low carb cereal we would need to pick one that everyone could undoubtedly agree upon as the best, so we decided on Cinnamon Toast Crunch. When it comes to low carb breakfasts, it's easy to go the route of bacon and eggs. We all do it and it works great. It's filling, delicious and basically no carbs. But, some of us can get bored of that and want to change it up and that's where low carb cereals come into play. Now, I've tried many low carb cereals from Amazon and there are a few options, but they just aren't low carb enough. We wanted to change that, because as I've mentioned, cereal is my ultimate food. We even have a couple others recipes that utilize more than just the standard bacon and eggs. Give our Keto Oatmeal and Keto Macro Cakes a try! Recipe can be quickly added to MyFitnessPal - Search "KetoConnect - Low Carb Cereal"
Pulse cheese and pork rinds in a processor. Add melted butter, cinnamon and stevia drops and pulse to combine. Lay out the cereal mixture onto a greased baking sheet and spread as thin or thick as preferred. Make sure it is even to ensure even heating. Lay another baking sheet on top and place it in to a 450 degree oven for 8 minutes. Remove top baking sheet and bake for additional 2 minutes. Remove pan and gently cut the layer into square pieces. It will still be soft so be careful when cutting. Remove any fully cooked pieces (usually around the edge) and place back into the oven for additional 8-10 minutes. Allow to cool and enjoy! Store in fridge.